A simple, small PaaS running on one host. Uses Docker and Nginx as the most important building blocks. It is written in Bash and uses Buildpacks to build an application specific Docker container. The big sister of Dokku. Building blocks used in Deis include CoreOS, Ceph, Docker, and a pluggable scheduler (Fleet by default, however Kubernetes will be available in the future). Buildpacks are used for creating the runtime containers. At least three servers are needed to effectively run Deis. Similar to Deis, but says it also supports non-12-Factor apps. There is even a possibility to manage VMs, not only containers. This, too, uses Docker as building block. Other components like scheduler are coming from the Tsuru project. Also similar to the two tools above. It also uses Docker as backend, but uses many project specific helper services. At the moment, only PostgreSQL is supported as a datastore for applications. This is more of a framework than just a "simple" platform. It is highly multi-tenant enabled and provides a lot of customization features. The architecture is very complex and has a lot of moving parts. Supports Docker and Kubernetes. Started in 2011 as a new PaaS platform using it's own project specific technologies, has been completely rewritten in v3 using Docker and Kubernetes as the underlying building blocks. Kubernetes and Docker are supported by big communities and are good selections to serve as central components upon which OpenShift is built. OpenShift "just" adds the functionality to make the whole platform production-ready. I also like the approach of Red Hat to completely refactor OpenShift V2 to V3, taking into account what they have learned from older versions and not just simply trying to improve the old code base on top of Kubernetes and Docker. Development happens publically on GitHub: https://github.com/openshift/origin. OpenShift Origin is"the upstream open source version of Red Hat's distributed application system, OpenShift" per Red Hat. Many enterprises want to or need to have support contracts available for the software which they run their business upon. This is completely possible using the OpenShift Enterprise subscription which gets you commercial support from Red Hat. The documentation at https://docs.openshift.org/latest/welcome/index.html is very well structured, allowing for rapid identification of a topic youre seeking. So why not chose Cloud Foundry? At the end of the day, everyone has their favourite tool for their own reasons. I personally found the learning curve for Cloud Foundry to be too steep. I didn't manage to get an installation up and running with success. Also I had lots of trouble to understand the things around BOSH, a Cloud Foundry-specific configuration management implementation. Takes client requests and routes them to backend application containers. In a default configuration it's a HAProxy load balancer, automatically managed by OpenShift. Every API call must be authenticated. This authentication is also used to check if you're authorized to execute the action. This authentication component allows for OpenShift to support multi-tenancy. Every OpenShift project has it's own access rules. Projects are separate from each other. On the network side, they can be strictly isolated from each other via the ovs-multitenant network plugin. This means many users can share a single OpenShift platform without interfering each other. There is a helpful web interface which communicates to the master via the API and provides a graphical visualization of the cluster's state. In Kubernetes, all containers run inside pods. A pod can host a single container, or multiple cooperating containers*". Roughly translated, this means that containers share the same IP address, the same Docker volumes and will run always on the same host. A pod can offer services which can be consumed by other pods. Services are addressed by their name. This means for example a pod provides a HTTP service on the name "backend" on port 80. Another pod can now access this HTTP service by just addressing the namespace of “backend”. Services can be exposed externally from OpenShift using an OpenShift router. A replication controller takes care of starting up a pod and keeping it running in the event of a node failure or any other disruptive event which could take a pod down. It is also responsible for creating replication pods in an effort to horizontally scale the lone pod. Three CentOS 7 64-Bit VMs prepared, each having 4+GB RAM, 2 vCPUs, 2 Disks attached (one for the OS, one for Docker storage). The master VM should have a third disk attached for the shared storage (exported by NFS in this example), mounted under srv/data. Read the following page carefully to make sure your VMs fit the needs of OpenShift: Installation Pre-requisites. Pay special attention to the Host Preparation section. You now have a 3-node OpenShift Origin cluster including persistent storage, ready for your applications! You can check the definition with: oc get pv. Now that the 3-node cluster is up and running, we want to deploy apps! Of course, that's the reason we created it in the first place, right? OpenShift comes with a bunch of application templates which can be used right away. Let's start with a very simple Django with PostgreSQL example. Before you begin, fork the original GitHub project of the Django example application to your personal GitHub account so that you're able to make changes and trigger a rebuild. The intent here allows you to control webhook configurations for your fork to trigger code updates within OpenShift. Once done, then you can proceed to create the project within OpenShift. Click on "New Project" and fill in all the fields. Name it myproject. After clicking on “Create” you're directed to the overview of available templates. The new-app command uses some special sauce to determine what build strategy it should use. If there is a Dockerfile present in the root of the cloned repository, it will build a Docker image accordingly. If there is no Dockerfile available, it tries to find out the project's language and uses the Source-to-Image (S2I) process to build a matching Docker image containing both the application runtime and the application code. Now navigate to the URL drupal8.apps.example.com and run the installation wizard. You'll want to set the DB host to "127.0.0.1" as “localhost” doesn't work as you might expect. At the end there is still a lot to do to get a "perfect" production-grade Drupal instance up and running. For example it is probably not a good idea to run the application and database in the same pod because it makes scaling difficult. Scaling a pod up scales all Docker images contained within the pod. This means that the database image also needs to know how to scale, which is not the default case. In it's heart, scaling means just spinning up another instance of a Docker image, but that does not mean that the user generated data is automatically available to the additional running Docker images. This needs some more effort put in. The best thing here would be to have different pods for the different software types: One pod for the Drupal instance and one pod for the database so that they can be scaled independently and the task of replicating user generated data can be done tailored to the softwares need (which is of course differently between a web server and a database server). When working with OpenShift, it's useful to have some commands ready that help getting information or show what is going on. If you can't remember who you are, this tells it to you. List of pods in the current project. Execute a command in the running pod. The command's output is sent to your shell. The default router runs HAproxy which is dynamically reconfigured should new services be requested to be routed by the OpenShift client. It also exposes its statistics on the router's IP address over TCP port 1936. The password to retrieve this is shown during the application's deployment or it can be retrieved by running oc exec router-1-<ID> cat /var/lib/haproxy/conf/haproxy.config | less. Look for a line beginning with "stats auth". Note: for some reasons an iptables rule was missing on my master node preventing my getting at the router statistics. I added one manually to overcome via sudo iptables -A OS_FIREWALL_ALLOW -p tcp -m state --state NEW -m tcp --dport 1936 -j ACCEPT. This is the main building block in OpenShift, so a good knowledge is necessary to get around the concepts of OpenShift. 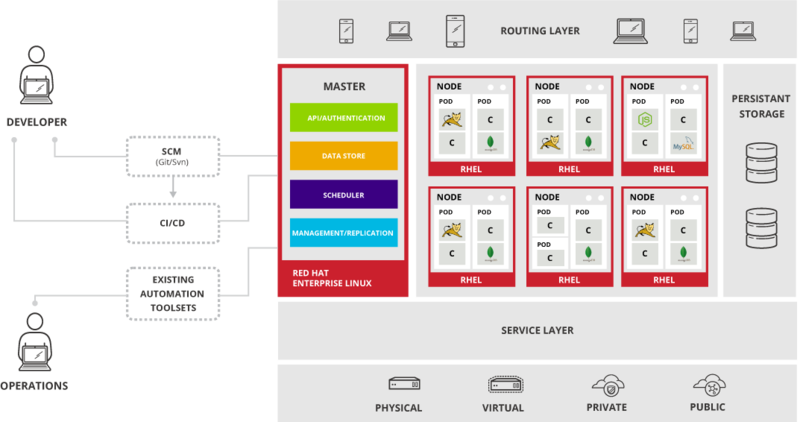 As this is the second main building block of OpenShift, it's also important to know how it works and what concepts it follows. To get the most out of a PaaS, deployed applications should closely follow the Twelve-Factor document. The Ansible playbook is a fast moving target. Most of the time the paths written in the documentation don't match the Ansible code sadly. Also some things didn't work well, for example upgrading from Origin 1.0.8 to Origin 1.1.0. The friendly people at Puzzle are working on a Puppet module to make the OpenShift installation and configuration as automated as possible. Internally it calls Ansible to do all the lifting. While it doesn't make sense to re-implement everything in Puppet, the module helps with manual tasks that have to be carried out after having OpenShift installed by Ansible. 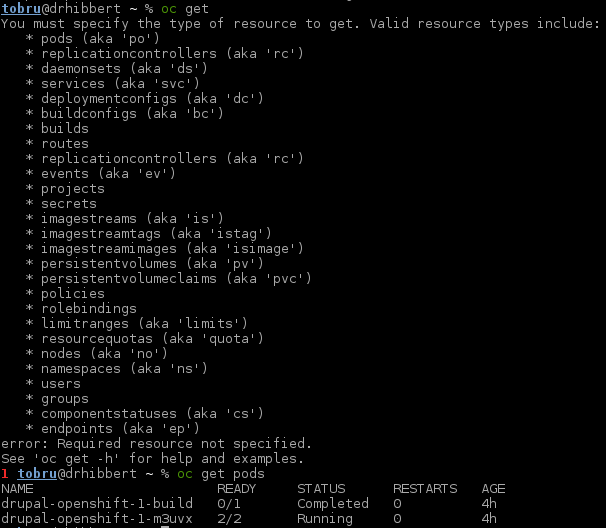 For an already existing Puppet environment, this is great to get OpenShift integrated. This blog post only touches the tip of the iceberg regarding OpenShift and its capabilities as an on-premise PaaS. It would need many books to cover all of this very exciting technology. For me it's one of the most thrilling piece of technology since many years and I'm sure it will have a bright future!